Phil Mickelson was visibly frustrated when they blew the horn on Sunday night at Pebble Beach before he could finish off his win at the Pebble Beach Pro-Am. But I'm sure after closing out the win on Monday, he felt it was all worth the wait. How Much Did Phil Mickelson Win Today? Mickelson finished off his three-stroke victory at -19 for the tournament, beating out Paul Casey, who placed second. Lefty took home a cool $1.368 million for his victory. As we look ahead to the U.S.Open, which will also be played at Pebble Beach in 2019, we have to take note of Mickelson's odds to win the only major trophy he has yet to place on his mantle. Mickelson is currently sitting at (+2400) to win the U.S. Open via FanDuel Sportsbook. How Many Wins Does Mickelson Have at Pebble Beach? 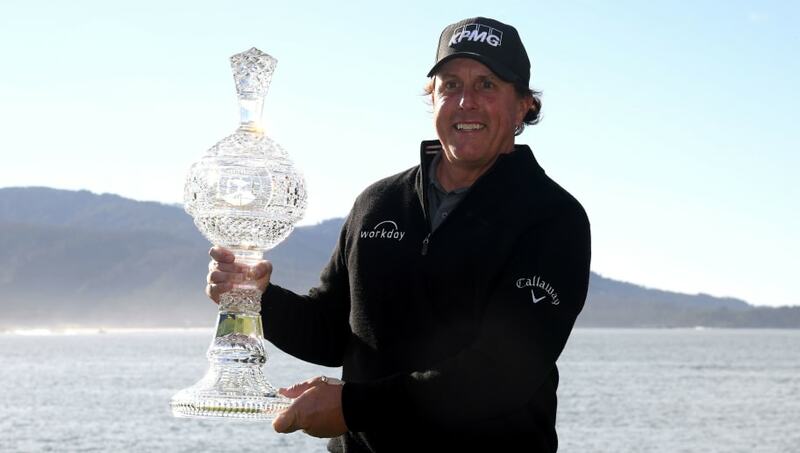 This marks Mickelson's fifth victory at the AT&T Pebble Beach Pro-AM. As we mentioned, with the U.S. Open returning to the famed Pebble Beach in June, Mickelson seems to have the inside track on this course and the momentum to finally take home the title and complete the career grand slam. How Many Runner-Up Finishes Does Mickelson Have at the U.S. Open? Mickelson has finished as the runner up six times at the U.S. Open. In 1999 at Pinehurst No. 2, 2002 at Bethpage Black, 2004 at Shinnecock Hills, 2006 at Winged Foot, 2009 again at Bethpage Black and 2013 at Merion. At 48-years-old, Mickelson grabbed his 44th-career win and hasn't shown any signs of slowing down. Yes, all of the young guns and Tiger Woods will be playing in the U.S. Open, many of whom have seen some form of success at Pebble Beach, but not many of them can match the motivation to get the win as Lefty should have. At (+2400), there is some value on a guy who has every reason in the world to finally get the win. He's definitely someone to keep monitoring as the tournament approaches.